I am presently at one level above, there are two large water tanks where I am standing to take this photo. 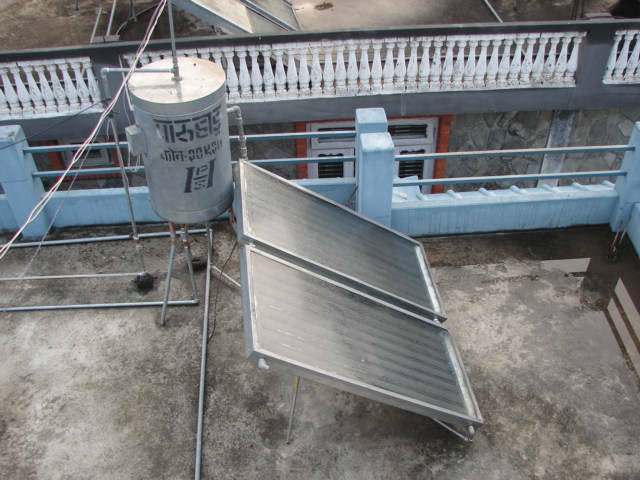 They pump the water up to the holding tanks, then gravity allows it to flow through this hot water solar device below. There appears to be no insulation on the tank, I think so the sun can warm the tank. This is made of galvanized steel, and would reflect most of the sun, however would get warm. I do not understand why they did not just use the big cheap and common black plastic tanks. There are electric hot water heaters you can hang in the water. It goes through this and I think straight to the rooms, I will look, but I do think there is an insulated holding area. Notheless, I heated up water with my one-cup cooker and took a shower, so I am good to go, I will nose around and see if the other guests take showers. The man said this cost about 60,000 Rupees, or about 900 US dollars for this, I think there is about 200 dollars in materials max. Nothing is complicated about this set up.